Here, we’ll be running down the biggest questions that we have about The Walking Dead season 10, which will naturally include major spoilers about the show’s events up till now. If you can’t be bothered to catch up on it all yourself, but still want to know what’s going on in AMC’s ongoing zombie apocalypse, check out these bitesize summaries of every episode in The Walking Dead season 9 recap, before coming back here to learn more about the future of the show at large…. 1. Whose voice was on the other end of the radio? This is the big question that’s on everyone’s minds right now. At the end of the season 9 finale, an ambiguous female voice crackles through on Hilltop’s radio, and while it’s hard to distinguish it as anyone familiar, they seem to be saying the following: “Hello? Can you hear me? Is anybody out there?”. The natural conclusion for many is that this is Maggie we’re hearing on the other end of the line, reaching out after heading to an undisclosed community with the enigmatic Georgie sometime between the events of Rick’s “death” and present day, but the show’s source material suggests otherwise. In The Walking Dead comics, a woman named Stephanie reaches out to Eugene over this very same radio, and develops a dialogue with Alexandria over the series of a few weeks. It turns out she’s from The Commonwealth, a huge city made up of 50,000 people that doesn’t look completely unlike a pre-apocalypse society (it has class conflict and everything!). Our best bet then, is that AMC is paving the way for The Commonwealth to enter the show, and we’ll probably see both Hilltop and Alexandria moving there once their run-in with The Whisperers has finished up. Of course, I’m still a little bit disappointed that it wasn’t the voice of Rick Grimes coming through but, let’s be honest, his undisclosed location is probably beyond the boundaries of radio contact entirely. 2. What will happen to The Whisperers? It comes as no surprise that The Walking Dead season 9 has kept The Whisperers as a threat beyond the finale, with Alpha looking to prepare for war against Alexandria and Hilltop, but where will the story take them? Again, in the comics, it’s a redeemed Negan who ends up putting Alpha’s ways to a bloody end, and the fact that Jeffrey Dean Morgan’s iteration of the Saviour looks to be on the mend suggests we’re headed to the same destination for season 10. Still, best steel yourself to see yet more characters die at the hands of The Whisperers, as I doubt Alpha has really forgiven Hilltop for taking her daughter away from the group. This nomadic cult of Walker wanderers will likely see their story arc come to a close by the time credits roll on season 10 but, what with this being The Walking Dead, that victory is going to come at a cost for some of our survivors. 3. How will Michonne leave the show? Following in the footsteps of both Andrew Lincoln and Lauren Cohen in season 9, Danai Gurira will be saying goodbye to the character of Michonne in The Walking Dead at some point over the course of the next season. But how do AMC plan to write the fan favourite leader of Alexandria out of the show she’s been co-leading since 2012? 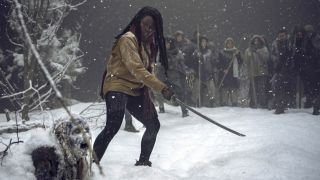 The most obvious answer is by killing her, of course, but rumour has it that Michonne could make an appearance in the upcoming Walking Dead movies with Rick Grimes. With that in mind, it’s possible that Gurira will exit The Walking Dead in a more peaceful manner, perhaps going out searching for her long lost lover as proof of his continued existence finally surfaces. It would certainly be disappointing not to see the pair reunited for one last hurrah and, like Rick, Michonne deserves a fate better than death to see her depart The Walking Dead for good. Season 10 will reveal exactly how AMC does justice to the character. 4. Is Negan about to become the hero? By the season 9 finale, Negan has effectively completed his transition from hero to anti-villain to new, law abiding citizen of Alexandria, and a potential lead protagonist for The Walking Dead season 10. As mentioned, AMC could be setting the character up for one last fight against The Whisperers before he himself succumbs to an untimely demise (we can’t imagine Negan sticking around long enough for Maggie to return, given their history), but that potential arc remains only a possibility for now. While this redemption story would follow the narrative of the comics, The Walking Dead has been more than happy to subvert expectations and chart its own path on the small screen, so a Negan renaissance isn’t a surefire bet. Still, the seeds have undoubtedly been planted for such a comeback, which would mean swallowing the bitter pill of rooting for a guy who, not two seasons ago, batted Glenn to death with a barbed wire baseball bat. Not the hero we deserve etc etc. 5. Where are Rick and Maggie? While both Rick and Maggie technically departed The Walking Dead season 9, the question about whether they could return in some form or another is still up in the air. For one thing, Rick’s upcoming direct-to-TV trilogy surely has to involve some sort of tie-in to the mainline show and, whether that involves a brief voice-only cameo or mere mention of the character’s whereabouts, I’d be surprised if he’s not brought up at some point over the course of season 10. As for Maggie, Lauren Cohen originally left the show to star in her own new sitcom for ABC, and the strong reception to its first season suggests she her schedule could be quite busy for some time. Both AMC and Cohen have expressed interest in bringing Maggie back to The Walking Dead in the future, especially as the character randomly took off without so much as a goodbye, but the details of what that looks like remain unclear for now. Just show us how little baby Glenn’s getting along, and we’ll be happy. Need to catch up on the latest in Walker Town? Read a summary of every episode with The Walking Dead season 9 recap right now.